Inspired by Rudyard Kipling's "Mowgli" stories, Disney's 19th animated masterpiece was the last animated feature that had Walt Disney's personal touch. 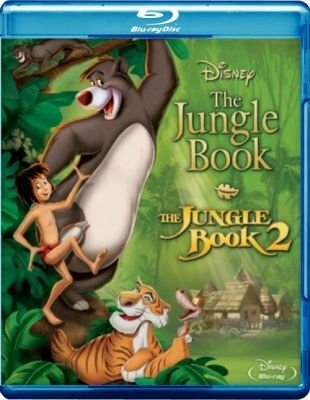 The jubilant adventure begins when Mowgli, a little boy raised by wolves, is urged by his friend Bagheera, a wise old panther, to seek safety in the man village. Feeling very much at home in the jungle, Mowgli resists and runs off. Much to Bagheera's dismay, Mowgli meets a new friend with a happy-go-lucky philosophy of life -- Baloo the Bear, a lovable "jungle bum." Together, the three buddies find the journey back to civilization anything but civilized! They encounter a crazy orangutan, the hypnotic and sly snake Kaa, and the menacing Shere Khan! Mowgli has been living in the man-village with his little step-brother Ranjan and his best friend Shanti. But the man-cub still has that jungle rhythm in his heart, and he misses his old buddies Baloo and Bagheera. When Mowgli wanders back to the wild for some swingin fun, he soon finds Baloo isn t the only one waiting for him... the man-eating tiger Shere Kahn is lurking in the shadows and planning his revenge. If he is to defeat his nemesis, Mowgli will need the help of both his old friends and his new family.